Rice is the cereal grains, the most common and most popular cereal food in the world. Belong to carbohydrates group of five food groups. Brown rice is particularly rich in fiber, minerals and vitamins. Rice is the base supply for more than half the world’s population. Rice is traditionally considered the birthplace of Asia, as it is in the north of modern Thailand and Vietnam where people first began to cultivate rice. RICE deservedly occupies an important place in the kitchen of many nations. The most important qualities of rice – is it’s high nutritional value and compatibility with other ingredients of the dishes – meat, poultry, fish, seafood and vegetables. 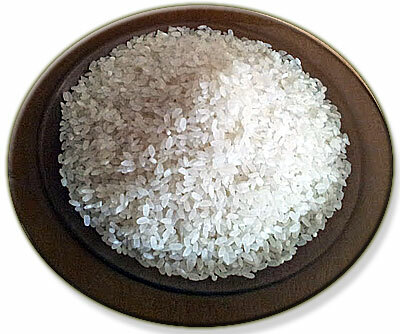 Rice highly useful for the human body, it not only makes energy consumption, but also an important source of proteins (6.4 g per 100 g of rice), carbohydrates (72.5 g) and minerals (potassium 70 mg Calcium 30 mg Magnesium 38 mg phosphorus 104 mg), and thus is low in fat (0.9 g). The more processed grain, less vitamins and minerals are in it’s content.. Rice is not an exception to this rule. The structure of a grain of rice is the same for all varieties of rice: the embryo of a new plant and crisp white rice grains containing starch, hidden under a layer of brownish bran shell, and in which are vitamins, minerals and other nutrients. The starch contained in the rice slowly digested and absorbed, thus ensuring a constant supply of glucose in the blood that helps regulate blood sugar levels in diabetics and plays the role of dietary fiber. There is no gluten in rice, so it is useful for those who have wheat intolerance (eg celiac, disease or Herter-Heubner, intestinal infantilism). Rice contains little quantity of sodium (retaining fluid in the body), but also a lot of potassium that promotes the excretion of sodium and rice consists eight essential amino acids. If at least once a week you arrange yourself a day of rice (using only water to cook it, without oil), you can lose up to 1 kg of body weight – and fluid end products of metabolism. All varieties of rice are high in fiber, protein, B -vitamins, calcium, iron, magnesium, manganese, potassium, phosphorus and zinc. Brown rice is particularly rich in fiber, minerals and vitamins. Caloric of rice – 333 kcal. The rice dishes are in almost every kitchen of the world: in Japan – sushi in China – rice cakes, noodles, in Central Asia – a variety of pilaf, Italy – risotto, Spain – paella, England – pudding. In China, make rice wine and rice vinegar in Japan – sake. Rice is a good source of energy because it contains large amounts of carbohydrates , is a rich source of potassium , magnesium, calcium , zinc, vitamins B, lecithin , gamma-aminobutyric acid . Rice also creates a protective film in the stomach , so it is recommended for use for people with gastritis and ulcers , as well as high acidity . Proved and use rice in the prevention of cancer formation . Rice is good for people with gluten intolerance , because gluten is not contained in the rice . Benefits of rice is also applicable in the fight against obesity . It not only helps to lose weight as soon as possible , but also has cleansing properties .